In conventional monolayer cell culture systems, cell nuclei show dynamic and cyclic changes in their shape and height. This phenomenon is pronounced during metaphase (M-phase). quantitative information from the entire thickness of cells because they exclude light from out-of-focus areas (Fig 1A). cells which include heterogenic populations of various cell cycle stages (Fig 1). In addition, saved digital images can be useful for precise observation and analysis of spatial distribution of intracellular molecules. Figure 1. The advantage of image acquisition feature. B) Schematic illustration of Z-stack image acquisition by the CQ1. 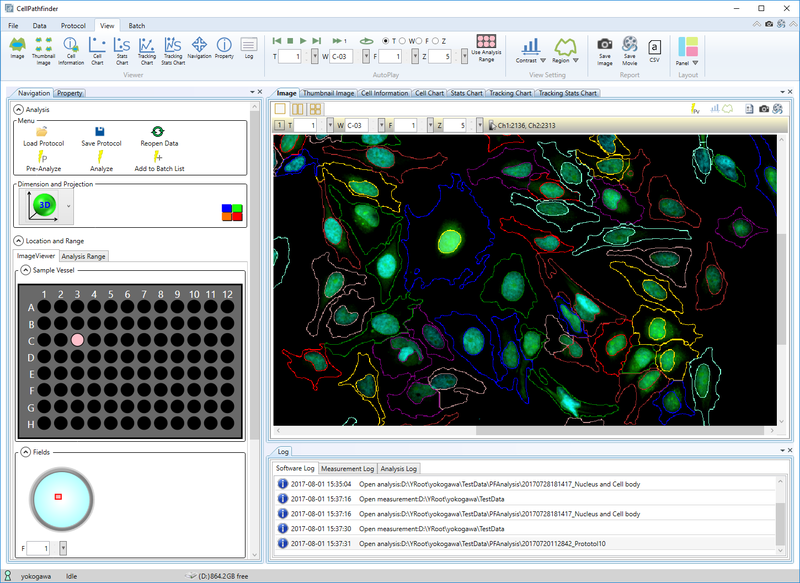 Sequentially acquired cell images along Z-axis were created using the SUM (summation intensity projection) feature of the CQ1 software (Fig 2A). Cell cycle analysis was carried out by using SUM images(Fig 2B). Morphologies of selected M-phase cell nuclei on the scattergram can be confirmed visually (Figs 2C and 3). Figure 2. Cell cycle analysis by the CQ1 with Z-stack image acquisition. Monolayer culture of A549 lung cancer cells in a 96-well glass bottom plate were fixed then their cell nuclei and alphatubulinmolecules were fluorescently labeledwith Draq7 (gray) and immunofluorescence (red), respectively. B) Scattergram of cell cycle analysis from SUM images and selection of M-phase cells (gray square). C) Selected M-phase cell nuclei (highlighted by green). Figure 3. Three display styles of Z-stack images. Enlarged Z-stack images shown in Fig 2. SUM (summation intensity projection) is suitable for quantitative light intensity acquisition from the entire thickness of cells and that, MIP (maximum intensity projection) is superior for analysis of fine cellular structures and intracellular distribution of fluorescently labeled molecules. Typical M-phase characteristics (e.g. chromosomal condensation and spindle formation) were observed clearly. Intracellular protein molecules governing M-phase progression, like Aurora kinases or TACC3, have been recognized as significant targets for cancer chemotherapeutic agents. A small molecule, ZM447439 is a specific Aurora kinase inhibitor and exerts suppressive activity against M-phase progression. In addition, affected cells with this chemical enter an additional genome replication but fail to divide resulting in the generation of polyploid nuclei. 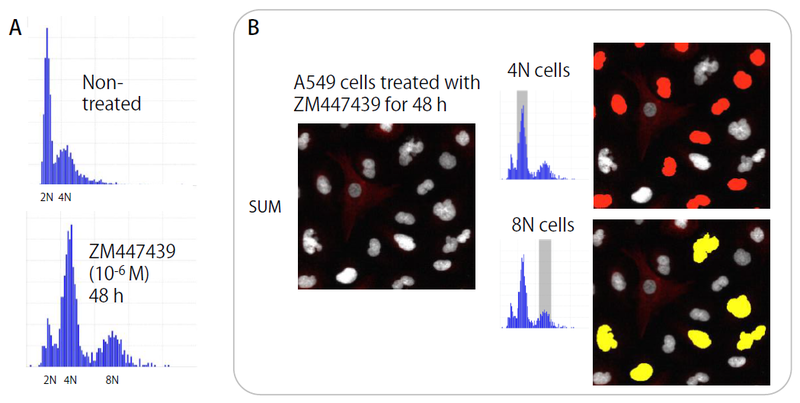 By performing cell cycle analysis by SUM-synthesized images of ZM447439 treated cells, apparent accumulation of 4N or 8N were detected on a histogram (Fig 4A). In addition, these polyploid cells showed non-uniform chromosome condensation and lack of spindle formation implying inhibitory effects on Aurora kinase-related molecular events (Fig 4B). Figure 4. Polyploidy analysis by the CQ1. A) Non-treated or ZM447439-treated A549 cells were stained and analyzed as described in Figure 2. B) SUM image representation of drug-treated cells and selection of polyploid cell nuclei. 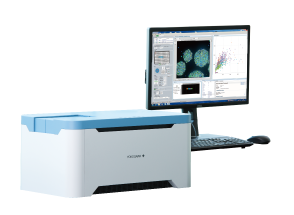 The CQ1 provides the highest quality confocal images and extended live cell imaging in a space-saving benchtop design. 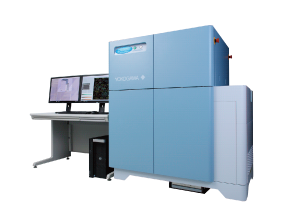 CellVoyager CV8000 is the most advanced high-content screening system. The improved built-in incubator lets you analyze extended live cell responses. 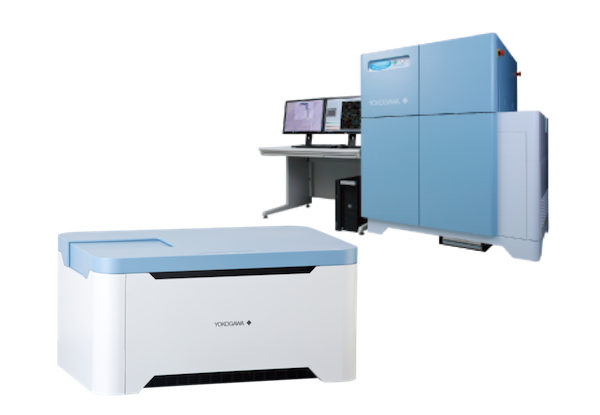 With its expandability, four cameras, five lasers and an optional built-in pipettor, the system permits increasingly complex assay development and high-content screening.